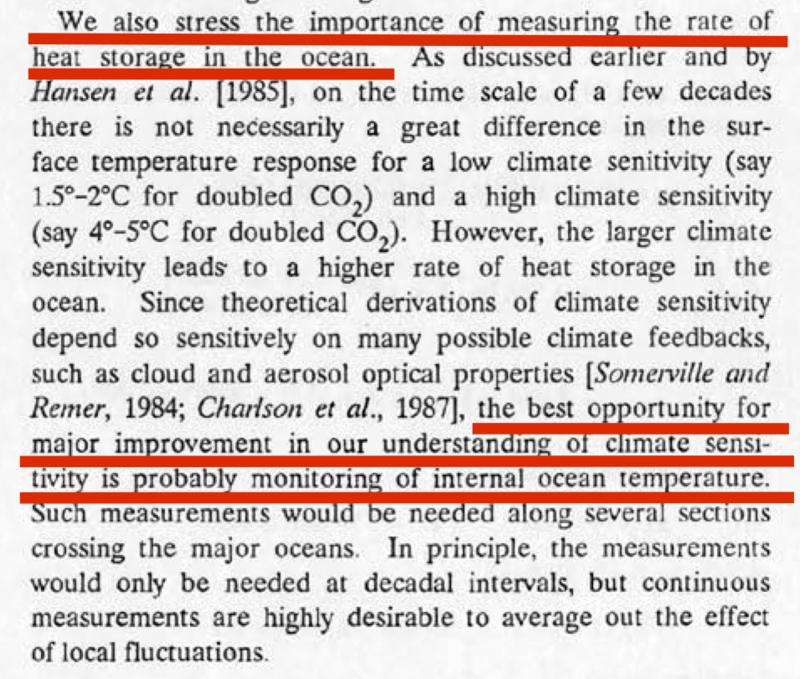 At least as far back as Hansen et al (1988), scientists realised the importance of characterizing the changes in ocean heat content as the key determinant of external driving of climate change as opposed to internal variability. The key realisation was that for a very low sensitivity planet, there is not much adjustment required to ocean temperatures, and so that can happen quickly without a significant heat imbalance for very long. For a higher sensitivity planet, more changes in ocean temperatures are needed, and so more heat needs to go into the ocean and that requires a longer period with a significant imbalance. Tracking the imbalance therefore gives you leverage in figuring out sensitivity. As with most model-observation discrepancies, people looked in multiple places for a resolution. Sampling was one obvious issue: was the sparse data, particularly in the early years and in the Southern Ocean, artificially increasing the variance in the data? That was looked at by AchtuaRao et al (2006), who found that yes, that was a factor, but no, it didn’t make up the whole difference. Others looked into whether the ocean models could be improved. 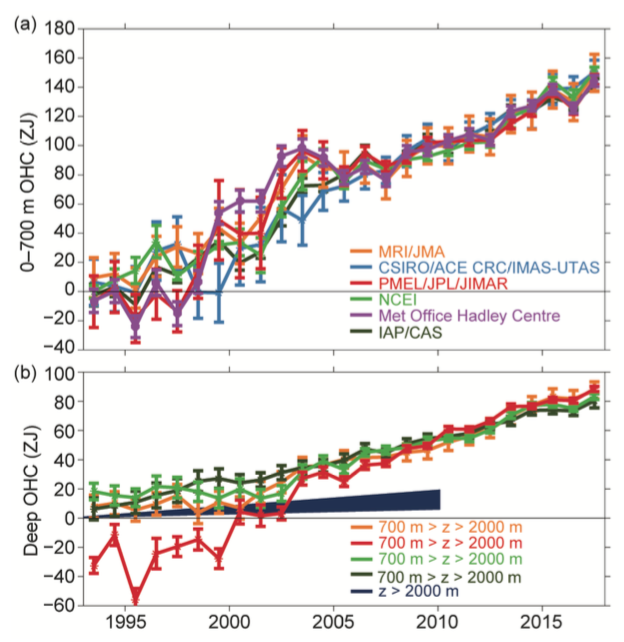 Meanwhile, other estimates of the OHC trend came from newer technologies, including the Argo floats (from ~2000 onward), and satellite altimetry (Willis et al, 2004) giving a 1993-2003 trend of 0.60 ± 0.10 W/m2, which did match the model trends for the more recent period (Hansen et al., 2005). However, as the Argo float network came to dominate the dataset (from 2003 or so), more oddities arose. For instance, it was reported that the oceans had dramatically cooled between 2003 and 2005 by Lyman and colleagues, only for the trends to be reversed a few months later once a pressure sensor error in some of the floats was revealed and corrected. Other scientists turned up yet another problem, and that was with the XBT data that made up a varying part of the ocean data going back decades (Gouretski and Koltermann, 2007). Many of these “eXpendable Bathy-Thermographs” needed a new correction to their fall speeds so that their data was correctly set to the real depth where they were measuring. Figure 4. Lyman et al (2010) compared to the same models in Figure 2. Figure 5. Levitus et al (2012). It will come as no surprise that all of this back and forth as data sets were improved and issues found and resolved, that there has been plenty of fodder for contrarians. From being too credulous when analyses appeared to show cooling, and too eager to accept that model-observation discrepancies are always the fault of the models, they often didn’t appreciate that actual science can be messy and is full of stops and starts as new ground is broken. 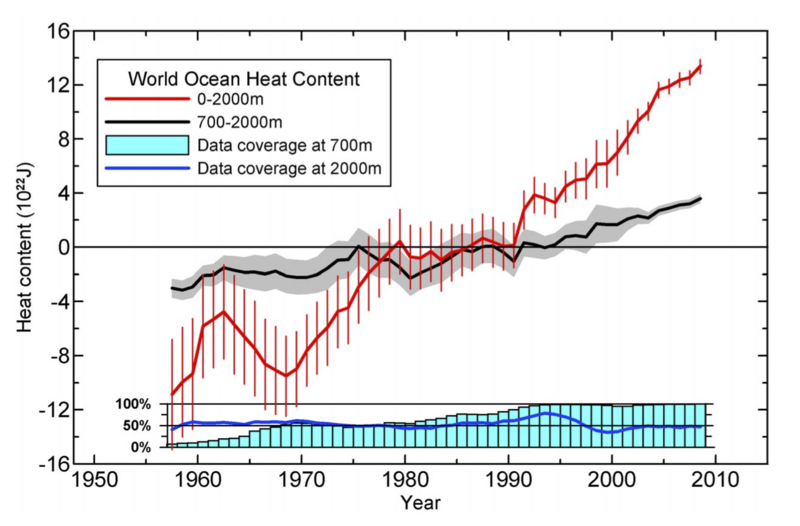 In recent years, the updates to ocean heat content have become routine, operationally available on a quarterly or annual basis via NODC, PMEL, CSIRO, and others like Cheng et al. (2015) etc. In the IPCC AR5 (2013) (Ch 3, Box 3.1) the rate of ocean heat uptake was estimated to be 257 TW for 1993–2010 equivalent to a mean global heat flux of 0.5 W/m2. Figure 6. Johnson et al (2018) in BAMS SOTC. For reference, the SOTC estimates (1993-2017) for the full depth of the ocean, which range from 0.62 to 0.79 W/m2, are already 25% to 60% bigger than was assessed in the IPCC AR5 report. Recently, a totally independent geochemical method based on the changing solubility of O2 and CO2 in the warming ocean (Resplandy et al, 2018) came up with a trend that was comparable to the rates in Fig. 6. Unfortunately, there were a couple of errors in the published analysis, but the corrected trends, 0.76 ± 0.45 W/m2, are nicely in line with the latest instrument-based numbers. The uncertainties in this methodology are too large for this paper to be definitive independent confirmation but, now that this method has been tried out, further work may well reduce them. As a topic, this key measure of climate change has had more than it’s fair share of false starts, corrections, revisions and updates (including from me). The complexity of wrestling with data streams that were not designed to track this issue until recently, combined with the intense interest in the answer which has attracted substantial independent work and scrutiny, has now however produced an overall synthesis that is clear. Figure 7. 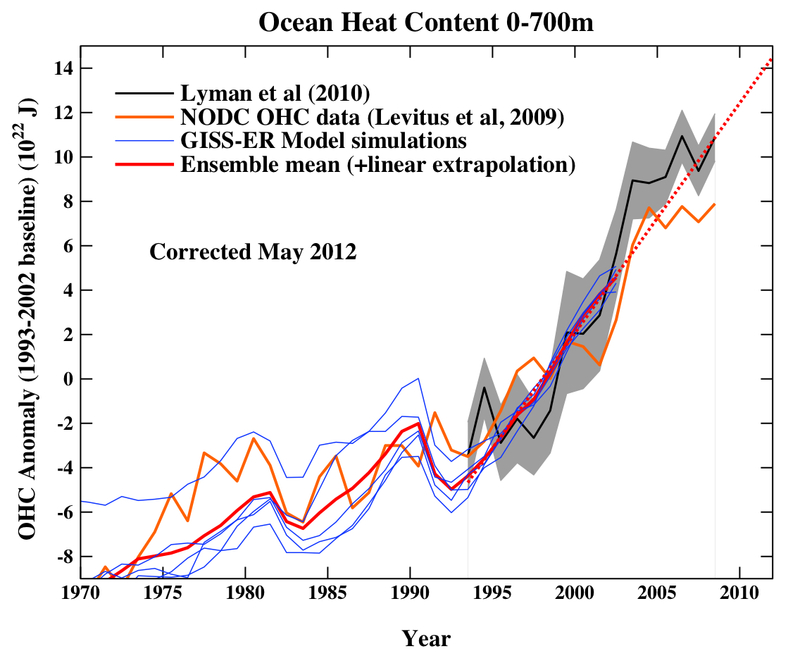 Ocean heat uptake estimates over the years (in W/m2 averaged over the whole surface). Values are for 0-2000m or 0-3000m where available, with the exception of the Willis et al (2004) and Lyman et al (2010) estimates which are 0-700m. Uncertainties are 1 standard error. PMEL/MRI/NCEI/CHEN trends are taken from Resplandy et al. The evidence suggests that ocean heat uptake has accelerated over the last couple of decades, and is likely higher than was reported in IPCC in 2013. The Resplandy et al estimates are consistent with the newer data. Going back to where we started, what does this allow to conclude about recent climate change? First, the size of the uptake implies that there indeed must be a significant energy imbalance for the planet. This in turn means there must be a larger radiative forcing driving this (for instance, due to the rise in greenhouse gases or an increase in solar activity – other evidence allows us to distinguish between these). But most importantly, this was a predicted effect, made in the earliest (and most basic) simulations as a consequence of a non-negligible climate sensitivity and greenhouse gas increases. In all the hubbub surrounding the latest paper, one would do well to remember that. A nice and clear review! Thanks Gavin. Thanks for all your work Gavin. Have a great Thanksgiving! Shouldn’t that be reason enough for moving that heat away from the surface? Heat pipes can accomplish this. The North Pole is warming twice as fast as the rest of the planet and the deepest waters of the Southern Ocean are also warming faster than anywhere else. Whatever effects the atmosphere with respect to global warming effects the oceans equally, therefore, 1000 meters deep at the equator is the safest place for the heat of global warming. 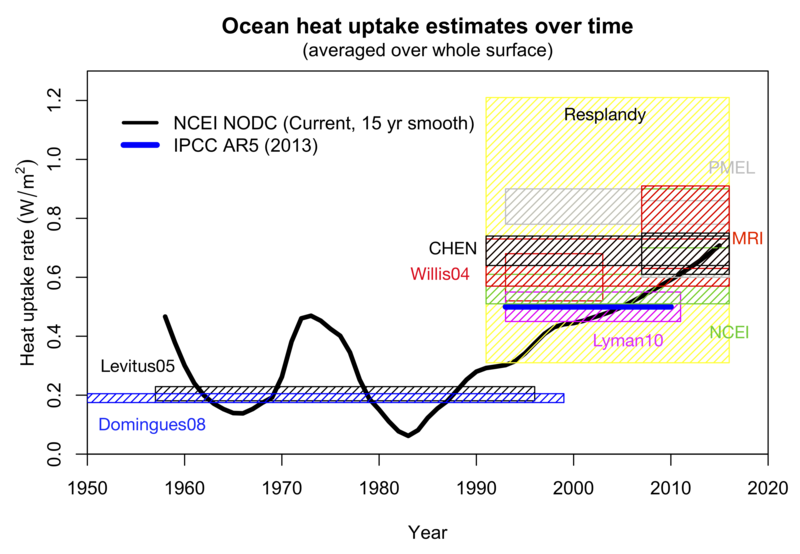 The revised estimate of the Resplandy et al. paper, shows ocean heat content is mounting at a rate of 1.21 ± 0.72 x 1022 Joules/year, which is 380 terawatts or about 21 times the 18 terawatts of primary energy that is currently being consumed annually around the planet. This article, Energy greed is good! describes how this 380 terawatts can be converted to 28.8 terawatts of primary for the next 3,250 years. Excellent review that will be useful for all, especially students! What implications does ocean heat content have for the roles of short lived climate pollutants in how climate change affects the world? Some argue that SLCPs are only reall worrying when we are near peak global temperature – but should we worry about their effect on OHC and sea levels? Ok but lest we get complacent, in your figure 7 the uncertainty ranges of some of the studies don’t overlap indicating the uncertainties are being underestimted. Perhaps someone should audit the other estimates. The narrative about science selfcorrection is a symptom of overconfidence or of excessive attention to appearances over substance. It’s pretty much the same as ECS where there has been no progress since the Charney report. We need to better than this. Especially since much of climate science over the last decade is about how Nic Lewis can’t be right about TCR or ECS. I am deeply shocked that Garvin has not explored the subject in greater historical depth. “that can happen”. What’s “that”? “for very long”. Decadal? Multi decadal? “more changes in”. Quicker/higher response? Increases/decreases? Why do we read a total incoherent and off topic comment from Russel (7) here? Thanks for the nice overview, Gavin. A layman’s guide to the threat of global warming was published twenty years ago. It was “The Heat Is On,” by Ross Gelbspan. In urging immediate action against fossil fuels, the book stresses the huge thermal inertia of the oceans: that they will be slow to heat up but once that happens the heat will be stored there for a very long time; in other words, once the heat-up occurs there is essentially no fix for it. Real Climate and its commenters frequently point out how long greenhouse gases will persist in earth’s atmosphere, but dwell less on the persistence of heat in the oceans. Both will of course be a dreadful burden for future generations … but it makes one wonder which will be the greater burden? This seems to be a rather important question, given that a drawdown of greenhouse gases is at least imaginable, but a drawdown of OHC not so much. The ratio of specific heats for sea water (3993 J/Kg*K) versus air (1006 J/Kg*K) is 3.97, say 4.0. Thus, each 10′ of ocean depth has a heat content approximately equal to the earth atmosphere. If the average ocean depth is 12K feet, then the ocean can hold 1,200 times the heat of the atmosphere. So, yes, using the oceans as a heat sink to buy us time may work. I’ll split the Nobel Prize with you for saving the world since I posted first. Greed IS good. Viva la profit! 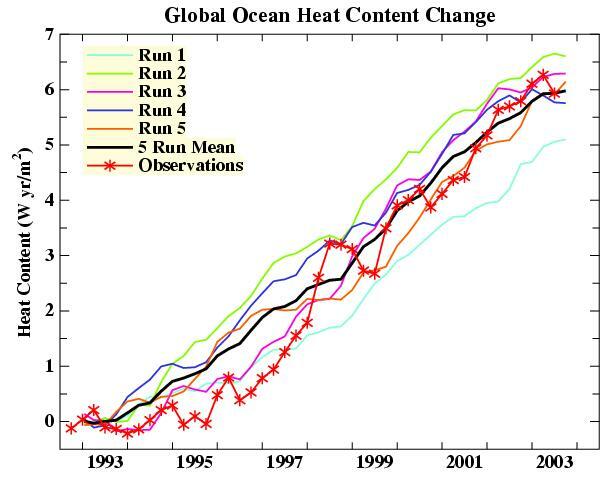 delta T for 3m of ocean = 2.73 K/year (4.91 F) if only the top 3 meters absorbed all the heat. So, what range of delta T are we talking per year over the deeper depths? Must be very small. Got a graph of ocean delta T per year versus depth? Missed an opportunity for snark, Russell. Guess who invented the oil spill? The Thomas W. Lawson was destroyed off the uninhabited island of Annet, in the Isles of Scilly, in a storm on December 14, 1907, killing all but two of her eighteen crew and a harbor pilot already aboard. Her cargo of 58,000 barrels of light paraffin oil caused perhaps the first large marine oil spill. Now that you have solved global warming [Jim Baird (3)] and got your Nobel Prize [Mr. Knows it All (12)] – have either of you seen an ocean? It is deep and big, you know. So, Jim, how much would cost a 3.7km long heat-pipe Jim scheme would need? How many of them would per 1 km^2? Then multiply by 362,000,000. As for Mr etc, who wants to pump the surface water down – – how much energy would it take to overcome the pressure of > 370atm at the bottom end of the pipe? KIA 12: Greed IS good. BPL: Ein Volk, Ein Reich, Ayn Rand! If you care to look at the article, it calls for heat pipes no longer than 1000 meters, 1 to 4 meters in diameter. At this depth sea water is at its maximum density and thus sea level rise is least impacted. As shown and costed here, 25,000, 1-GW plants would cost $2 trillion annually, produce $7 trillion in revenue, while avoiding $4.7 trillion, in environmental damage. Alternatively, 125,000, 200-MW plants would cost $3.7 trillion, produce $5.5 trillion in revenue, while avoiding still avoiding the $4.7 trillion in environmental damage. The longer it takes to scale this solution, the more costly it is and the more environmental damage the planet sustains. Warm water is less dense than cold water. It can also boil a low-boiling-point working fluid to produce energy and to move the heat into deep water. Munk estimated that the diffusion rate of water in the ocean is 4 meters/year. A cubic meter of water at a temperature of 4C warmed .005C, the annual surface temperature rise since 1880, isn’t going to rise much faster than this, so it is going to take about 250 years for the heat to resurface. This is a 250 year buffer against the full impact of warming. Ocean thermal energy conversion depends on the thermal stratification of the ocean. Once back at the surface the heat of warming is driven back to 1000 meters to set the warming clock back another 250 years and more energy is produced. With each cycle about 7.6% of the heat of warming is converted to the benefit of mankind and we can derive this benefit for at least 3,250 years or 13 heat cycles. This link,contains an animated gif showing the heat of warming, represented by light bulbs, and how they are recycled. You suggest cooling the surface of the ocean by pumping warmer water lower in the ocean, or by pumping deeper/cold water to the surface. In the alternative, Greg Rau and I have suggested a way of converting OTEC power to hydrogen, while sequestering CO2 and neutralizing the acidity of the ocean rather than just making it more acidic at a greater depth. Cooling the surface by pumping deep/cold water to the surface is how conventional OTEC operates. It is essentially a dilution solution. The problem with the approach is, it is at least half as efficient as heat pipe OTEC, and it spreads the heat of warming across the surface like an oil slick. Moving heat towards the poles is the last thing the planet needs. As soon as warming heat has migrated out of the OTEC zone, which is essentially 15 degrees either side of the equator, it is unavailable, permanently, to do work. To be productive the heat of warming has to be confined within the OTEC zone and recycled there. Everywhere else warming heat is nothing but a detriment. Piotr: even at 1 km you pipes would have to withstand the water pressure of 100 atm, and how many would you need to produce and then operate to move enough heat from surface waters to depth. Jim: At this depth sea water is at its maximum density and thus sea level rise is least impacted. Piotr: no, it is not at “its maximum density” at 1000 m. If it were, it would quickly sink to the bottom. Jim: Warm water is less dense than cold water. Munk estimated that the diffusion rate of water in the ocean is 4 meters/year. A cubic meter of water at a temperature of 4C warmed .005C, the annual surface temperature rise since 1880, isn’t going to rise much faster than this, so it is going to take about 250 years for the heat to resurface. This is a 250 year buffer against the full impact of warming. Piotr: No, Munk’s estimate is about the diffusion rate in the absence of the massive thermal convection your scheme would be creating. And your estimate of 0.005C per year is wrong on so many levels – the most imp. is that at the end of your heat pipe you would be heating the adjacent water instantaneously by MANY degrees (the difference between the tropical surface water and 1000m is ~ 25C), and NOT not 0.0005C per year. Parcels of such warm water would rise to the surface like balloons – in Lab and Greenland Seas we are talking of max vertical velocities of 5-10 cm/sec and that for smaller density difference then if you bring the 25+C heat pipe medium in contact with say 4C water at 1000 m. at 5 cm/ec – your warm water would be back at the surface in 5 hrs, not “250 years”. Piotr: I am afraid that you misunderstood your colleague – according to your link, he wants to pump the warm water down, not cold water up. Which means that your reservations about pushing the warmer surface water toward the poles are misplaced, as the polar waters would be drawn toward the equator. But this also means increased upwellings, which would bring CO2 rich deep polar waters to the surface. Alternatively the warmed equatorial deep water would move locally up through thermocline and bring with it – surplus CO2 closer to the surface. Hence the OPPOSITE of sequestration your colleague claims as an important advantage of his scheme. And wouldn’t releasing surface water at 700m – require pumps powerful enough to pump HUGE volumes of water against … 70 atm pressure at 700 m? Do we have such pumps and how much energy would this cost? Water pressure of 100 atm. Using CO2 as the working fluid would increase the internal pressure by about 50 atm so half of the problem solved. With Ammonia we calculate the wall thickness of the heat pipe should be 1/25th the radius of the pipe. The thickness effects the thermodynamics but the vapor doesn’t condense until it enters the condenser so the thickness of heat pipe isn’t a concern. As the vapor condenses a partial vacuum is produced so the walls have to be sturdy. For a 200 MW plant you need 33,000 – 10 CM OD pipes, 33 meters long,so the thickness of the pipes has to be .4 cm to handle the pressure. If the heat of warming is 380 terawatts (from the article) you need 140,000 -200 MW plants,thus 140,000 heat pipes and 33,000 times that for the condensers and evaporators. The coldest water is -2.2C on the Antarctic shelf. It can be that cold because of its salinity. It sinks to the floor where the temperature is 0C. The coefficient of expansion is least at 4C thus 1000 meters. It increases below that due to pressure and salinity that have little to due with sea level rise, which is the point of the article and is the greatest risk of warming. Tenberth and Caron estimated the annual mean poleward transports of atmospheric energy peak at 5.0 ± 0.14 Petawatts. This is 1/13th of the 380 terawatts of warming heat that is impacting the thermohaline in any event. Particularly in the North Atlantic. The middle depths of the tropics are particularly stagnant. Witness the the shadow zone in the Pacific that has trapped the world’s oldest ocean water around 2km below the sea surface for over 1000 years. The region is close to anoxic with very little life. Motivating circulation in these regions would be beneficial. Vega calculates the velocity of cold water through the condensers would be 400 m3 s-1 for a 200 MW plant. This is a massive dilution of the heat that should increase the temperature of the water by about .5 degrees C.
Correct me if I am wrong but the conversion of calories/second to Watts is 4.1868. One cal of heat raises the temperature of one gram water 1ºC, so 4.1868 watts should raise 1 gram of water 1ºC. 200MW is 200,000,0000 watts so it would raise 47,769,179 grams of water 1C. 400 cubic meters is 400 million grams of water so it should be warmed by about a half a degree.Now consider this half a degree has to heat a column of water 1000 meters long before to gets back to the surface. I make that a warming of only .0005 C over the entire water column. Hurricanes cool the ocean surface by 1.5C and there are dozens of them annually and have little effect of the thermohaline circulation. Nor would heat pipe OTEC, which is the same thing upside down divided by about a 100. I understand Vicente perfectly well. Conventional OTEC, not his plan, pushes warm surface water toward the poles and would cause off gassing of CO2. I will let him defend the sequestration benefits of his plan or its pumping requirements if he likes. You are welcome to try to contact him. And Mr. Know it all can speak for himself. Heat pipe OTEC overcomes this problem as well as the parasitic losses of pumping cold water. A working a fluid in a closed system has losses of only 1.3% according to Prueitt. Furthermore, Rau and Baird, sequesters CO2 as a carbonate permanently. “As shown and costed here,”. The here link doesn’t work, page not found. Jim Baird (22): I understand Vicente perfectly well. Jim: Furthermore, Rau and Baird, sequesters CO2 as a carbonate permanently. Piotr: I think this is a different CO2. I was talking about CO2 brought to the surface by the thermal convection driven by, depending on the scheme, heating the deep water or cooling the surface water, adjacent to your heat pipe. The net result is the same – more high-CO2 deep waters would make its way into the surface layer and when warmed there – degas CO2. Now, some of the extra CO2 would be taken up by increased productivity of algae (ascending deep water would bring also nutrients), but not entirely – since the water at 1000m would have come from much colder climate and therefore when heated to tropical surface temperatures – have much higher pCO2, and, therefore, CO2 outgassing potential. This “convection” CO2 is quite different from the “captured” CO2 that might be sequestered if some of the extracted heat is used to convert CO2 to carbonate ions, what the paper seems to be talking about. The CO2 is sequestered not brought to the surface. This reaction can take at the surface in the deep. In deep water you can use graphene sieves to remove the salt from the water so you don’t produce Chlorine rather than O2. Also at depth the H2 reaches the surface 70% of the way to the pressures needed for transportation. Then can you still count this as “negative emissions”? Aren’t you sequestering CO2 from the water that would have not made it to the surface layer on their own? So let’s play with some numbers – if you were to discharge the deep water into the surface layer then you would bring with each m3 SURPLUS 0.2 mol of (total) TCO2 per m3 of water you discharge (2.2 mol in deep water – 2 mol of surface water you displace). of surplus 400*0.2= 80 mol of CO2/s. Annually, that’s 3.5kg CO2/sec =111 kT of CO2 of positive emissions per year. The main point is – whatever the removal of CO2 during you process – your “negative emissions” – would have to be first applied to offset the positive emissions from bringing deep water into the surface layer. What your palnet would have emissions – positive or negative – would depend on which of the two is larger and by how much. * Density – all I have said that your sentence: ” At this depth sea water is at its maximum density and thus sea level rise is least impacted.” is incorrect. The sea level rise is least impacted not because the density is maximum there (it is not), but because the thermal expansion coef. is near its lowest. – The water at 2km in the Pacific has not been “trapped there for over 1000 years”, Over 1000 years it moved from near Greenland to the Pacific (part of the Thermohaline Circulation). – when speaking of thermal convection I was talking about global impact – but the local impact of heat pipe – even if the deep water is not physically dumped in the surface layer – being warmed by the pipe would rise. How far would depend on what is it temp after the contact with the hear exchangers. *Hurricanes: Jim: “Hurricanes cool the ocean surface by 1.5C and there are dozens of them annually and have little effect of the thermohaline circulation. Nor would heat pipe OTEC, which is the same thing upside down divided by about a 100. Not really. Hurricanes do not set up thermal convection so they a poor model for the convection caused by releasing cold water at the surface and/or warm water at depth. The reason why – the surface water after a hurricanes has temp. 1.5 C colder not because it was cooled by the hurricane, but because the winds mixed the hot surface layer colder waters below. In other words hurricane spread the surface heat over larger volume (“mixed layer”). SO the drop in surface temperature could have been even 5C it would still cause 0 convection -= because the water that is supposed to sink is still WARMER (less dense) than the water below it. That’s why for the speed of the convection I have looked for places where the convection happens, not for hurricane affected waters where by definition convection cannot happen. From, Negative-CO2-emissions ocean thermal energy conversion we point out, “As the concentration of CO2 in surface seawater is consumed by the preceding addition of hydroxide, the partial pressure of CO2 in seawater, pCO2, will also decline. If this pCO2 falls below that in the overlying atmosphere, a flux of CO2 from air to ocean will occur, and hence air CO2 removal is effected. However, due primarily to subsurface ocean respiration and advection of the resulting CO2 to the ocean surface, large areas of the surface ocean are periodically or continuously supersaturated in CO2 and degas to the atmosphere. It is therefore possible to reduce the CO2 burden in the atmosphere by only absorbing this excess marine CO2 prior to degassing, without necessarily requiring actual CO2 removal from air. I think therefore it is probably as beneficial sequestering deep water CO2 as it is limiting it at the surface. Thank you for engaging in the discussion. Density: I may well have not framed this point very well but as I understand it, we now agree that sea level rise is lowered by moving heat from the surface to 1000 meters because the thermal coefficient of expansion is at a minimum there? At that depth the heat can’t melt polar ice, amplify hurricanes, increase desertification and kill vegetation that becomes fuel for wildfires. In general, cooling the surface is beneficial to humanity. Heat is moved by the Thermohaline Circulation in narrow and distinct channels. Much of the middle levels of the oceans, below the mixed layer, are virtually stagnant and anoxic. Being heated at the bottom of the heat pipe this water would rise. To my mind it would beneficial to marine life to get this water moving. Furthermore, a heat pipe is virtually a binary system, heat in, heat out. You get work out of a heat engine by capitalizing on the extremes between the hot source and the cold sink. What happens between the two as the dumped heat rises back to the surface is immaterial. Back at the surface the heat becomes again an input for another work cycle. The correct question is how fast will the heat rise? By my estimation it wouldn’t be much faster than Munks 4 meters/year because of the dilution of the heat in the much larger greater volume of water below the mixed layer than above it. Heat sequestration of 250 years, accompanied by the production of 28 terawatts of emissions free energy, gives atmospheric CO2 levels a chance to start declining. As the gas levels drop the sequestered heat can gradually start coming out of the oceans and be radiated back to space. You say hurricanes are a poor model because they don’t up thermal convection. Please consider the following. In a Hadley cell, air rises near the equator, flows toward the poles above the surface of the Earth, returns to the Earth’s surface in the subtropics, and flows back towards the equator. The last graphic in this article shows ocean heat be cycled in an aquatic convection cell that is essentially a mirror image of the Hadley cell. Instead of looking for places where convection is happening naturally, I think we have to create some of our own if we are to solve the problem of climate change. Regarding the graph. Will ocean heat uptake level off when the rate of increase in surface temperatures stop accelerating (assuming all other mechanisms for surface to ocean heat transfer remain the same)? Nice work, thanks a lot for this summary. [Response: Post-1992/3, forcings have been very positive and increasing: i.e. There is no contradiction between the two. Convection REQUIRES density inversion – denser water sitting above less dense water. So when you warm a parcel of deep water with your heat pipe – the heated water become less dense than the water above it – and you have a convection. Alternatively, when you cool a parcel of surface water with you heat pipe – again you create convection. Hurricanes, on the other hand, typically DO NOT create convection – because ALMOST ALL cooling you observe is not because hurricane extracted heat from the topmost water, but because it mixed the hot top water with the underlying slightly colder water. This mixed water is still warmer than the unmixed water below of it, hence NO convection, REGARDLESS how big drop in the surf temp. you observed after the hurricane passed. – and bottom 10cm has 0C. – bottom 10cm has 0C. So you observed a “5C drop in surf. temp.” – Yet NO CONVECTION! We can even relax the assumption that heat extraction by hurricane is negligible. Still no convection. That’s why cooling by a hurricane is a poor model for thermal convection. I stand corrected. A hurricane is a poor analogy. There are substantial lags between forcings, SST, shallow ocean heat content, and deep ocean heat content. It is quite possible that the heat content increase since the 1980s is due to the jump in co2 levels starting in the 1940s. Could you state this for a scientifically educated non-climatologist? Why are bigger changes in ocean temp needed for a higher sensitivity planet? Maybe state this in terms of where heat is going, staying — Ocean Heat Influence on Sensitivity for Dummies? Got it! That is clear. Thanks for restating!